To determine if you are a good candidate for Disc Rehydration Therapy you will consult with Dr. Campbell personally to review your history and the results of any imaging tests relative to your current spine/disc condition. Common tests for a patient with low back and lower extremity pain may undergo: lumbar spine X-rays (films), CT scan (computed axial tomography scans), MRI scans (magnetic resonance imaging), myelograms, post myelographic CT scans, EMG/NCV (electromyogram/nerve conduction velocity) studies, discograms, and bone density tests. Lumbar spine films: these plain X-rays are good at showing alignment of the spine. Degenerative changes, thinning disc spaces, any slippage, known as spondylolesthesis or subluxations are easily visible on plain X-rays. Also, compression fractures of the vertebral bodies are easily visible on plain X-rays. Tumors can also be detected with plain film radiography. CT scans: these show “cross sections” of the spine. They are pictures of the body divided into very small slices. These “slices” of the body, can accurately reveal the anatomy within. When used on the spine, they detail bone very well, but are not quite as good at showing soft tissue, such as herniated discs, nerves and tumors. CT scans use X-rays, which are sent through the area of interest in numerous directions, then a computer adds the images in 3-dimensions, and then displays the pictures so they can be easily understood by your doctor. 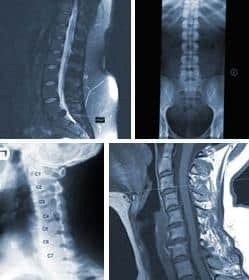 Myelograms: a myelogram is a study in which the radiologist performs a spinal tap, places a dye (a dye which shows up on X-ray and CT scans) into the spinal fluid, then is X-rayed; following this, post myelographic CT scans are performed. What is provided is an “outline” or “shadow” of the pathology. For example, instead of seeing a nerve root sheath filling nicely from the dye in it, it may show nice filling to a point, and then show a bump in it. These studies are often performed in patients where the MRI studies are ambiguous, or in patients who have a pacemaker implanted for the heart (pacemakers cannot be used in the presence of an MRI machine). Although they have been used very infrequently in the past, MRI scans are obtained much more commonly now because they are non invasive. EMG/NCV studies: these studies monitor the electrical function of nerves and muscles, whereas, the above studies detail anatomy or appearance. There is a difference. Imaging is taking a picture of that which is visible; e.g., you could tell how tall a person is and color of one’s eyes; however, you would be unable to determine whether they had high blood pressure. A blood pressure measurement would tell that. These are tests of function. In a similar way, an EMG/NCV is a test of function, which looks at how well a nerve or muscle works.